Monty (left) at the Mane Event. Well I can’t believe I have been so long in blogging again! The time seems to be just flying by. I am off to Germany and Austria to teach tomorrow but thought I’d give a quick update on what has been going on lately in the Equispeak world. 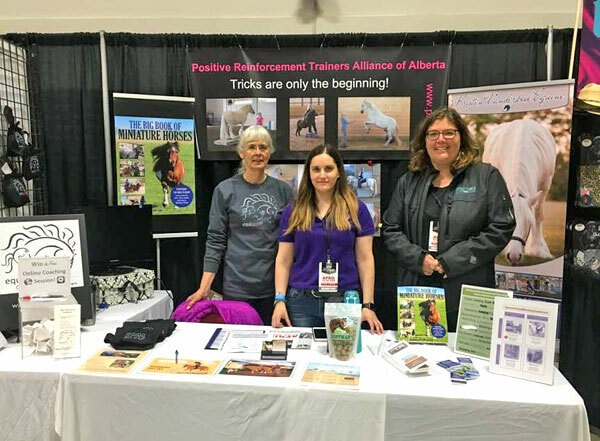 In April a couple other positive reinforcement trainers and I got together and had a booth at The Mane Event. It was a little scary as these kinds of things are usually very traditional. My first lecture on the “Power of Positive” was early Friday morning, usually a time where the diehard shoppers go through before all the casual wanderers do so I was hoping for a handful of people at best. Well I ended up with almost a full house! It was so nice to see! There were the well-seasoned horse people, perhaps looking for a different way, but there were lots of young people too which was so encouraging as it will be that generation that will make the change happen. The Sunday morning PowerPoint was on how to start training with a clicker and the time slot was up against the finals of the colt starting so I figured it would be an empty house. Once again I was delightfully surprised to find an almost a full house. And for two solid hours after the talk the booth was filled with folks asking questions and wanting more information! That made us all feel very good! In May I had two lovely ladies fly over from France to take four days of Intensive Clinic with me here with my schoolmasters. They had great fun and left with heads bursting. I will be giving a clinic in France at their school in 2019. Video coaching is also picking up with several lessons a week, which again is wonderful but sure doesn’t leave much time to get the long awaited online course up and running! I appreciate your patience with this for those of you waiting and will perhaps have a special deal for early birds when it finally launches! Tomorrow I am off to Germany for my first European Tour to do two clinics and a few private lessons with my video coaching students over there. It will be so nice to finally meet and see them in person. I’ll try and get a blog on that trip up shortly after I return before life runs away again! Till then Keep it Positive!